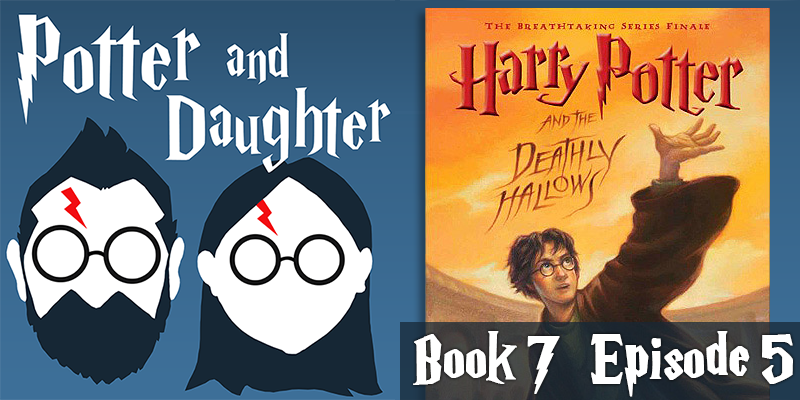 In episode thirty-two of Potter And Daughter Joel and Lily review chapters 26-31 of Harry Potter And The Deathly Hallows. Harry, Ron and Hermione execute a daring daylight heist, then Harry’s connection with Voldemort finally reveals the location of the final Horcrux. Harry meets another Dumbledore, and is reunited with his friends from school, who have been living through a dangerous adventure of their own. A bit of sleuthing in the castle points Harry to the identity of and possible exact location of the item he seeks, while Harry’s friends, his teachers, the reformed DA, The Order and more begin taking back the school.